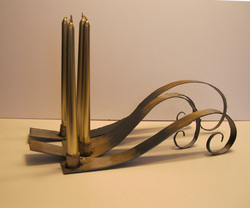 "SWIRL" is a series of individual candle holders for table top and mantle decorating. paste in a variety of hues. Each is an individual design. "Swirl" is both upward and downward. The candles are spaced for interest and variety on the table scape. Any color candle can change the mood and season of these pieces. Gold, Red, Brown, White candles look great, too! Using the cutouts from other projects makes these trees unique and contemporary in design. This grille work is the thing that makes this piece original. 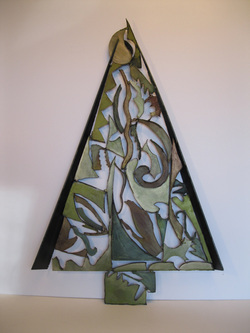 Gilders paste colors in a variety of green s unify this modern tree design. Each tree is unique because of the use of cut-out pieces in the grille. 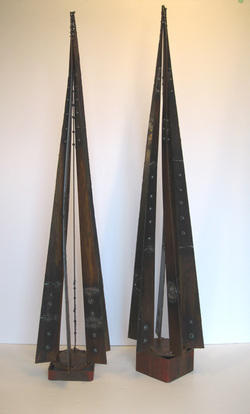 "Rising" series features gracefully positioned steel ribbons. Colored with similar colors to the swirling series for an expansive table scape. Columnar trees in a clean modern style. These trees are left rusted steel with a protective spray. Ribbons, Christmas balls or metallic cords can be easily draped in the spaces to add dramatic color and texture. Simple welded studs add subtle design element. feature cutouts and mini star shapes. Each tree is unique in shape and coloration are similar to have the ability to use in groupings as centerpieces or mantle decorations. 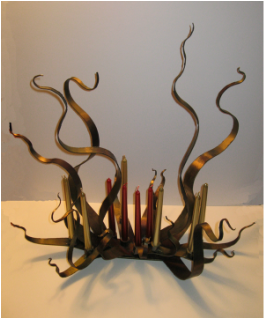 Recycled Materials are used to make individual candle holders. 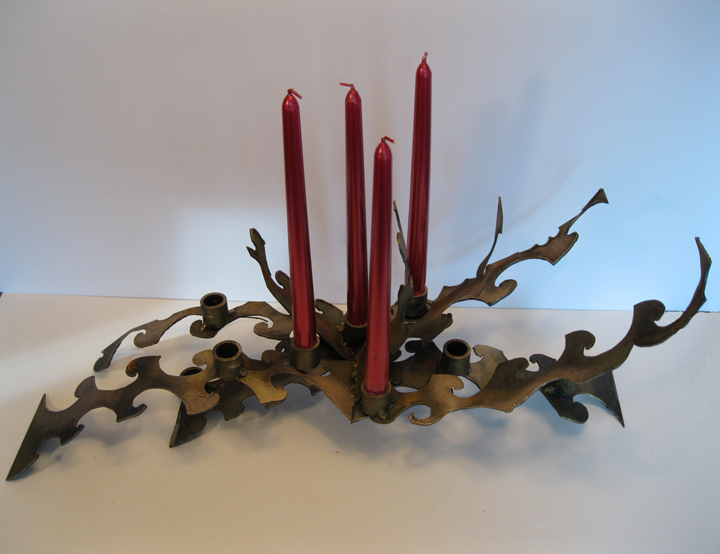 Whether celebrating Christmas or just a holiday season, these candle holders form the basis for home decorating. Switch out red candles with other colors to extend the decor theme of each season. 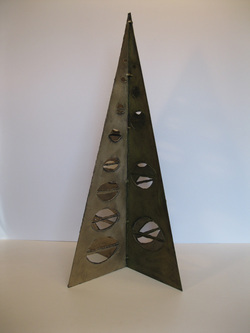 Metal Contemporary tree can remain colorless or be custom colored when purchased. 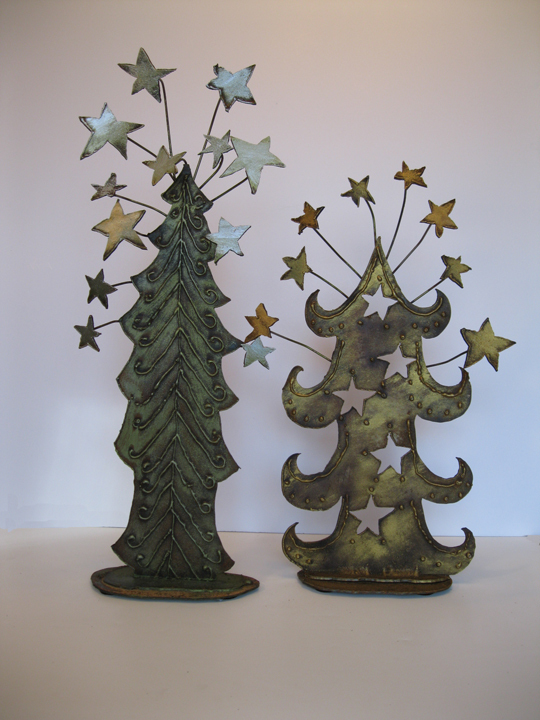 Modern cutouts add a modern whimsey to that seasonal decoration. These colors have provided a Christmas feel without the use traditional red and green. German silver and African bronze are modern and clean. 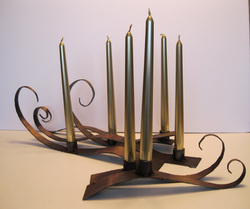 This larger version of a rustic star candle holder will accommodate 8 candles for a larger, dramatic center piece on a table, mantle or buffet.. 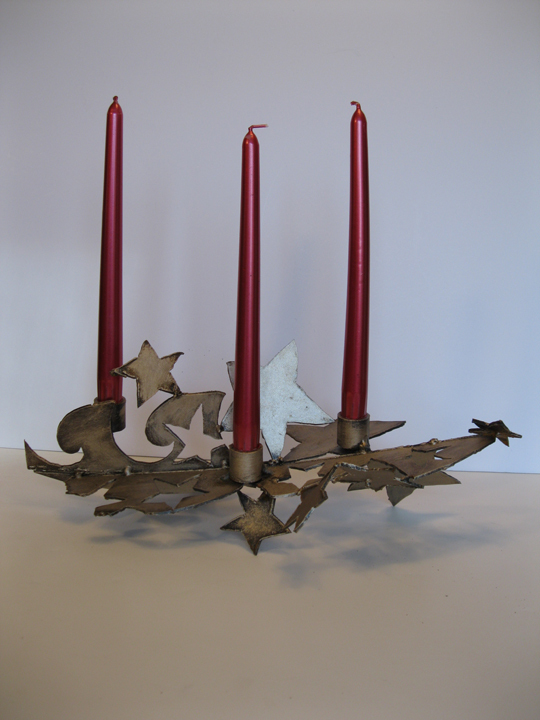 Using rustic star design, this little holder is perfect for a limited space.